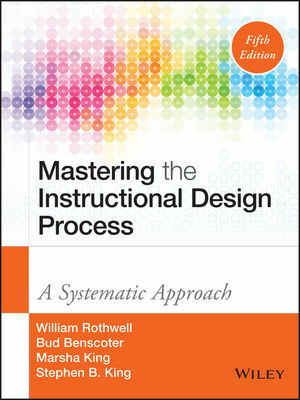 Mastering the Instructional Design Process provides step-by-step guidance on the design and development of an engaging, effective training program. The focus on core competencies of instructional system design helps you develop your skills in a way that's immediately applicable to real-world settings, and this newly updated fifth edition has been revised to reflect the new IBSTPI Competencies and Standards for Instructional Design. With a solid foundation of researched and validated standards, this invaluable guide provides useful insight and a flexible framework for approaching instructional design from a practical perspective. Coverage includes the full range of design considerations concerning the learners, objectives, setting, and more, and ancillaries include design templates, PowerPoint slides, lecture notes, and a test bank help you bring these competencies to the classroom. Instructional design is always evolving, and new trends are emerging to meet the ever-changing needs of learners and exploit the newest tools at our disposal. This book brings together the latest developments and the most effective best practices to give you a foolproof framework for successfully managing instructional design projects. Effective training programs don't just happen. Instructional design is a complex field, and practitioners must be skilled in very specific areas to deliver a training program that engages learners and makes the learning 'stick.' Mastering the Instructional Design Process is a comprehensive handbook for developing the skillset that facilitates positive training outcomes. WILLIAM J. ROTHWELL, PHD, SPHR, CPLP FELLOW, is a professor of Workforce Education and Development at Penn State University. An editor for the International Journal of Training and Development, he has authored, coauthored, edited, and coedited more than 93 books. G.M. (BUD) BENSCOTER, PHD, is the owner of GMB Performance Group and author of several articles and books on instructional design and talent development. MARSHA KING, PHD, is the president of SkillPoint Consulting where she coaches leaders on management and leadership best practices. STEPHEN B. KING, PHD, is vice president of Talent & Leadership Effectiveness at Allstate Insurance Company.